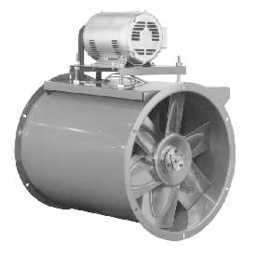 Industrial high pressure vaneaxial and inline tubeaxial duct fan / blower sales. Quick ship of propeller tube axial fan ventilators, high temperature tubeaxial and vaneaxial fans with steel wheels, heavy duty high capacity high pressure tubeaxial blowers - industrial and OEM inline fans and tubeaxial ventilators. Axial flow fans designed and built with duct housing for general ventilation purposes using ductworks, where large volume of air is moved at static pressures not exceeding 3" WG. Sales of Chicago Blower, Canada corrosion resistant, high pressure and high temperature sealed fan/blower ventilators. Canada Blower wall mounted FF filtered fan is designed for supply applications requiring low volumes of filtered air at low pressures. Each Canada Blower ventilator consists of a fan section, filter section, and motor guard. The fan section includes a direct drive panel fan constructed of heavy-gauge steel and equipped with a statically and dynamically balanced cast aluminum fan propeller ventilating.com fanblower.com highpressureblower.net industrialblowerfan.com industrialfanblower.net industrialfanblower.com pressureblower.net northernindustrialsupplycompany.com industrialpressureblower.com tenderall.com chicagoblowercanada.com cbblower.com buffaloblower.com buffalofan.com nis-co.com canadianblower.com olegsystems.com canadablower.com abbblower.com acmefan.net industrialblower.net fansandblowers.net americanblower.net barryfan.com cincinnatifan.net canadafans.com barryfan.net pennbarry.net pennfan.net tcffan.com. The aluminum fan propeller is suitable for medium temperature ranges and mildly corrosive atmospheres. Canada Blower fan propellers are equipped with malleable iron split taper bushings to assure perfect alignment and positive locking of the propeller to the fan shaft.